Stephanie (Brittany Anne Woodford) just got dumped by her boyfriend Chad (Kanin Guntzelman) in the cruelest way possible. Chad is break-up brutal, pointing out every one of her flaws. Stephanie may have taken a lot lying down from Chad in the course of their relationship but she’s not going to take this. Luckily Stephanie has a good support system of close friends to be there for her in her time of need. She doesn’t need emotional support post break-up; Stephanie needs help burying his body. “Friends help you move… Real friends help you move bodies.” Do you have three friends you can trust to keep your secret? Friends Don’t Let Friends bury a body alone. The worst thing imaginable happens when this body is buried. The car won’t start, and the four friends are stranded at the secluded, shallow grave. Steph’s friendship with Dave (Jake White), Carrie (Jenny Curtis) and Jeb (Brendan McGowan) is about to be tested as boundaries of friendship are pushed to their limits. This secret won’t stay buried. Something is about to tear this groups Identity apart. “Four people can keep a secret when three of them are dead.” Know who your friends are. Writer and director Jamie Brown tried to shoot an entire feature in one night. Brown may not have made his deadline but the majority of Friends Don’t Let Friends was filmed that night. With such a short filming schedule, the tiny cast does well. It’s a dark, creepy, psychological thriller with some gritty scenes that’ll make you want to rip your face off. 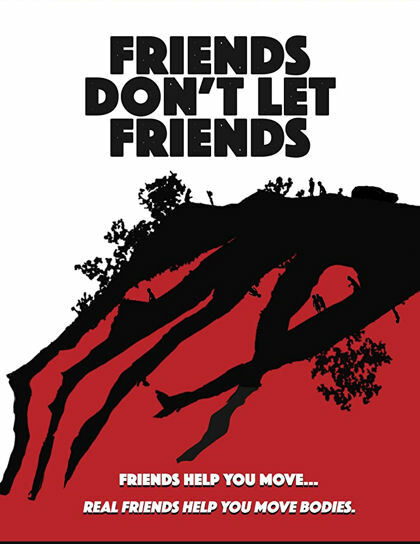 Friends Don’t Let Friends is a layered exploration of the mind with some of the creepiest hands ever on film. The limited budget does affect quality for this OCD critic who is still impressed by what was accomplished in such a short time. Jake White’s face ripping scene and the reanimated earth monster with the magnificent hands alone makes me want to see what Jamie Brown can do with a bigger budget and proper scheduling. "And there was silence..."